Darlington Timber Sheds are now OPEN! 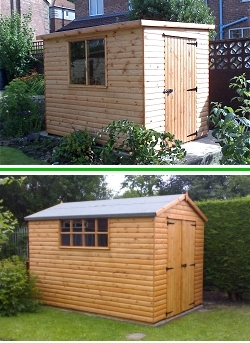 Looking for a quality Garden Shed at Darlington Timber Sheds we supply the trade and public top quality timber garden sheds, wooden garages, wooden playhouses, summerhouses, aviaries, dog kennels, rabbit hutches, poultry hen houses, wooden arches, pergolas, arbours, wooden garden fencing, sheds, timber decking and many other timber products. We are located in Darlington, County Durham and serve the whole of the UK. Darlington Timber Sheds is a family run firm and have an unrivalled reputation for selling only top quality garden sheds and timber products with caring customer service and great value for your money. All our wooden timber sheds and products are joiner made by top quality time served craftsman, and we only use the finest graded timber's sourced direct from local suppliers in the North East of England. All of our garden sheds, playhouses, summerhouses, aviaries, dog kennels, rabbit hutches, poultry hen houses, wooden arches, pergolas, arbours are treated with either high quality solvents or a water based mahogany coloured stains all which is environmentally friendly and pet safe. We use Perspex windows for safety in all garden sheds and playhouses, and all the roofs are covered as standard with a green mineral felt, however we do also offer a premium felt shingle tiling service if requested, and remember all our workmanship and garden sheds, fences and timber products are guaranteed by ourselves.